We’d love your help. Let us know what’s wrong with this preview of Yvain by M.T. Anderson. Eager for glory and heedless of others, Sir Yvain sets out from King Arthur’s court and defeats a local lord in battle, unknowingly intertwining his future with the lives of two compelling women: Lady La In his first graphic novel, National Book Award winner M. T. Anderson turns to Arthurian lore, with captivating art by Andrea Offermann bringing the classic legend to life. To ask other readers questions about Yvain, please sign up. A different way to delve into Arthurian stories. But why Yvain? There is an undercurrent of an odd feminism here (or maybe anti-feminism) - women who must manipulate men to see justice. Which is why of course love is bound with hate. Yvain's behavior is a good conversation starter. Hero or no? And the graphic novel approach is appealing for a new generation. Interesting Arthurian tale. Artwork was pretty great but sometimes rough. A superbly told and illustrated graphic adaptation of Chrétien de Troyes's medieval Arthurian legend. Anderson's text is clever, nuanced, and especially perceptive in rendering a feminist subtext. Andrea Offermann's elegant illustrations are appropriately dramatic, emotional and magical. A compelling, stylish retelling of Arthurian lore. Apparently, what I need for my school are JUNIOR graphic novels. My students love things like the graphic novels of Stormbreaker and anything by Raina Telgemeier, but when I hand them books that have nice art, well developed plots and tiny print, they flip through them and don't realy read them. That might be because the students who like the graphic novels are often struggling readers. Medieval romances are very bizarre. I say this having dearly loved my medieval literature classes in college; I wrote my first major research paper on the Lay of Sir Launfal. Also, I was a King Arthur junkie as a child; I designed an elaborate game with my friends in which we all pretended to be Arthurian characters reincarnated as teens (I was a sulky Morgan La Fay). So I have a long-standing appreciation for the legends of the Round Table. Additionally, Anderson is one of my favorites; Octavia Medieval romances are very bizarre. I say this having dearly loved my medieval literature classes in college; I wrote my first major research paper on the Lay of Sir Launfal. Also, I was a King Arthur junkie as a child; I designed an elaborate game with my friends in which we all pretended to be Arthurian characters reincarnated as teens (I was a sulky Morgan La Fay). So I have a long-standing appreciation for the legends of the Round Table. Additionally, Anderson is one of my favorites; Octavian Nothing was such a harrowing and brilliant book, and the ironic parody of Feed is only exceeded by the poignant desire for connection that it expresses. But there is something for me that doesn't fit between the cinematic art--though absolutely gorgeous--with its emphasis on close-ups and psychic depth, and the romance-like story-telling, which hinges on inexplicable decisions and mythic encounters. In other words, it feels strange to apply the emphasis on interiority in the lines of these tortured faces to a story that is based in a dream world of exteriors: women imprisoned and sewing for half-demons, a knight encountered by a weather-stone, a lion who discovers a new master. All of the art was beautiful, but its emphasis on close-ups and kinetics felt wrong for me in the context of a romance that is ultimately about ethical failures and apparently disjointed quests. That being said, I loved that the artist used tapestries for story-telling and scene-setting, and sometimes even to anticipate events; the tapestries, even when they were jokey and postmodern, still felt more of a piece with the writing. Anderson tries to stay fairly faithful to Chretien de Troyes, which means there's not much editorializing, but I do sense his sly humor in certain asides about the lion being an unwelcome houseguest and a weather-stone that can be tampered with by any passerby as an inconvenient form of climate control. His afterword is fantastic, and I love that he draws out Troyes' subtle court satire and also that this "romance," in spite of the contemporary implications of the name, ends with a woman still furious, yet forced for the sake of her kingdom to make certain compromises. Anderson's feminism drew him to a story of two wily woman and a surprising dopey and self-centered knight, and I like his interpretation in the afterword that what seems like a moral reformation may not be so complete. I wish he had been a member of the class in my college medieval literature courses; I think we would have loved talking about romance and irony. Read an advanced copy through Netgalley. I was really pleased with this adaptation. I've never had a strong background in Arthurian lore, so I was pretty much able to just enjoy the story. The author and illustrator notes made all the difference in the world . I liked the flow of the graphics, but I did not enjoy the story. The women in here really get the short end of the stick, and it was hard to read about one of the main characters forced into an arrangement that made her miserable. Yvain himself is blindly self centered and oblivious to other people's feelings. While I enjoyed the art style and the visual aspect of the page, the story was less than engaging. I was struck by the combined feminism and lack thereof - while the story revolves around the women in Arthurian legend, the limited agency of those women was noticeable. graphic rendering of Chretien de Troyes "Yvain." Arthurian romances and postmodernism seem to have a lot in common--the first can feel very amoral in its depictions of its heroes, who have an untidy penchant for cutting off people's heads, and the second likes to blur the line between hero and villain, right and wrong. So it is with M.T. Anderson's retelling of Chrétien de Troyes' story of Yvain. Part of the opening narration warns us to expect irony, "There was once an age when love was honorable. Or so I've heard." What follows is a tale of Arthurian romances and postmodernism seem to have a lot in common--the first can feel very amoral in its depictions of its heroes, who have an untidy penchant for cutting off people's heads, and the second likes to blur the line between hero and villain, right and wrong. So it is with M.T. Anderson's retelling of Chrétien de Troyes' story of Yvain. Yvain sets off to avenge a cousin and kills the lord of a castle. While hiding in the castle, he is aided by the handmaid Lunette. But upon seeing the newly widowed lady of the castle, Laudine, Yvain falls immediately in love with her, despite her hatred of him and grief for her husband. Desperate to protect her people, Laudine finds herself forced to accept Yvain's help. Update: I purposely didn't read the author's note in the back or other reviews until I finished the book. Most of the text comes directly from the source material, which is interesting, but doesn't necessarily mean the emphasis is the same as in the original. The author's note and reviews focus on the role and problems of women in the medieval world. There are definitely texts from the medieval period that read as feminist today, but it's also hard not to read them with our own attitudes in place. I believe Anderson that the original is "in many way the poem is about a confrontation between the world of women and the world of men . . . a chivalric contest, as it were, between romance and bromance." I just wish in his version the male characters had a little more depth and nuance to them. Otherwise, it's like the sympathetic female characters are titling at straw men. Kudos for creating a book that isn't crystal clear, but with a more balanced character distribution it could have been so much more. I love M. T. Anderson's work. I wasn't familiar with the Yvain legend. It's a great vehicle for teens to explore the social mores of the time. How the people interpreted Christianity and honor and valor. I loved how the story exposed the restricted but potentially powerful role of women acting behind the scenes and behind the men. I love that the story honestly shows Lady Laudine's exploitation as she's forced to accept a man she despises, who murdered her first husband and abandoned her to go gallivanting around the jousting circuits. An excellent interpretation of Arthurian myth. Andrea Offerman's artwork is spectacular! The story itself is unsettling, like many of the Arthurian tales, and its characters are simultaneously brave and foolhardy, kind and conniving. The author's note from Anderson does much to illuminate some of the contradictory messages in the text, and Offerman's illustrators note adds valuable historical context as well. I love the roughness and strangeness of Arthurian romance, of von Eschenbach and de Troyes -- comics sometimes verge on the slickness of Hollywood screenplay, and it's refreshing to read a standalone comic that isn't afraid to be weird, to be tonally all-over-the-place, to be unsatisfying, because that's exactly what its source material happens to be. At the same time, this is a polished package of a story with some excellent choices in layout and storytelling. Very good stuff. This GN version of the twelfth Century Arthurian Yvain legend raises questions about the nature of heroism, the battle between good and evil, and the role revenge plays in our lives. I found reading it in our current political environment compelling. “There are many secret chambers in our hearts where love can hide and many battlements where hate can stand, watching for enemies.” Perhaps we need to watch for Love a little more and watch for Hate a little less. Enjoyed the story, didn't love the art. It was pretty, but the text balloons didn't really go and I'm not sure what could have been done about it. Sir Yvain, as a knight of the Round Table, demonstrates bravery and purpose. He often takes on challenges, like fighting a giant and demons, for other people, because it is his purpose to serve. I am a new comer to graphic novels but I think I have found my favorite sub genre in it. The historical graphic novels. Much as I love graphic novels, I often struggle with American graphic novels, preferring manga and manhwa with their many volume stories. A couple hundred pages with very little text don't seem like enough most of the time to tell a complex and nuanced story. There's not enough time to invest in the characters because the book's so soon over. Though I like Arthurian legend, I didn't really get the point or desired audience for this. I don't feel like this is especially compelling teen fare, espec Much as I love graphic novels, I often struggle with American graphic novels, preferring manga and manhwa with their many volume stories. A couple hundred pages with very little text don't seem like enough most of the time to tell a complex and nuanced story. There's not enough time to invest in the characters because the book's so soon over. Though I like Arthurian legend, I didn't really get the point or desired audience for this. I don't feel like this is especially compelling teen fare, especially as it's not really retold in any exciting fresh way. It does feel antiquated. The afterword talks about how there was a goal of highlighting the role of women, and I can see that Anderson tried, but ultimately it's still decidedly not a feminist title, with a woman forced into marrying and then forgiving Yvain. I'd have liked to see a true retelling that put a brand new spin on the tale, rather than a regurgitation of the original accompanied by illustrations. Maybe I'm wrong and teens will dig it, but I didn't really get the appeal. This was a strange book. I'm not a big fan of Arthurian legends; most of my knowledge of them lingers from having read The Mists of Avalon some years ago. I missed that type of female dynamic. I didn't get the motivation of these characters. They were spiteful and vindictive in not-very-sensible ways (the women), and the men were stupid. The artwork is beautiful, as is the book itself. It just wasn't my cup of tea. The Author's Note at the end was probably my favorite part. Read in galley so I am eagerly awaiting the finished copy. Even with these "low resolution images" Offermann's illustrations have terrific energy and emotional impact. I love the tapestry-like panels on many of the pages that reinforce the sense of the legend and the Middle Ages. Anderson's retelling of the Arthurian story is richly layered and carries multiple threads that will give older readers much to think about. It is also a wonderful gateway to Arthurian stories and will surely propel man Read in galley so I am eagerly awaiting the finished copy. Even with these "low resolution images" Offermann's illustrations have terrific energy and emotional impact. I love the tapestry-like panels on many of the pages that reinforce the sense of the legend and the Middle Ages. I enjoy King Arthur stories and this was intriguing fun - sweeping and eventful. The palette is mostly muted save for flashes of red mostly representing the blood that was shed in battles but could be the arc. Panel sizes vary from nearly thumb-nail size to double-page spreads. Author and artist notes at the end enhance understanding. Looking forward to seeing the finished book. I originally read Yvain on Netgalley via my kindle. We are going to discuss Yvain next week at our book camp for teachers, so I read a final copy tonight. I was impressed by the design of the book as well as the detailed author and illustrator's notes. Definitely a great read for anyone interested in old legends. M.T. 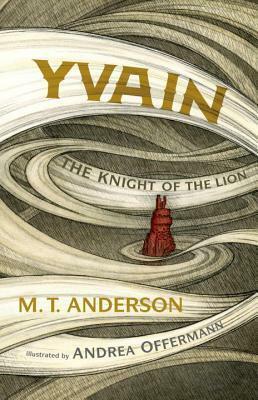 Anderson moves from his success as a novelist to the medium of a graphic novel to tell the Arthurian legend of Yvain: The Knight of the Lion. Much of the work is based off the legendary poem by Cretien de Troyes with plenty of additional research done by the author and illustrator for a well-rounded and authentic collected telling of this classic story. However, this was my introduction to the character of Yvain and the two women whose lives are so dynamically affected by his choices, and I M.T. Anderson moves from his success as a novelist to the medium of a graphic novel to tell the Arthurian legend of Yvain: The Knight of the Lion. Much of the work is based off the legendary poem by Cretien de Troyes with plenty of additional research done by the author and illustrator for a well-rounded and authentic collected telling of this classic story. However, this was my introduction to the character of Yvain and the two women whose lives are so dynamically affected by his choices, and I was surprised by the sharp critique of the culture in regards to women's freedom as it casts a dark view at what would typically be a happy ending (Cretien himself apparently showed this same conflict between Yvain and Laudine). The story is wonderful with excellent pace and spectacle, but the art is not as great a success. Yesterday, I finished reading Philip Pullman's the Adventures of John Blake. Some of my response is based on the inevitable juxtaposition between that and this. Though the stories are obvious unrelated, there's a lot they have in common. Two JUV/YA authors first tries at the graphic format; two relatively untried artists. Who will win the battle at the cornucopia of my heart? Anderson wins, but by little more than a nose. I disliked the art in Pullman's book a great deal -- I dislike the art in Yesterday, I finished reading Philip Pullman's the Adventures of John Blake. Some of my response is based on the inevitable juxtaposition between that and this. Though the stories are obvious unrelated, there's a lot they have in common. Two JUV/YA authors first tries at the graphic format; two relatively untried artists. Who will win the battle at the cornucopia of my heart? Anderson wins, but by little more than a nose. I disliked the art in Pullman's book a great deal -- I dislike the art in this one, too. The battle sequences aren't effective, too swirly and confusing. Though some of the panels here look great, the majority look poor characterized. BUT -- this one's better for me because it understands how to tell a story visually. There are sections -- not just fight scenes -- when the narrative story telling is told by pictures, not just by words. The spreads are more effective - there's multiple two page spreads. And, most importantly, the art and text rely on each other to tell the story. That's what makes this format great -- when the two streams of narrative work together, they create a kind of story telling that isn't available to either one alone. Yvain -- perhaps Anderson -- understands this; it's obvious from the first sequence of the book that this is going to be a more effectively told story than The Adventures of John Blake.